We take a look at Aberdeen’s trip to Celtic Park. The Dons are back on the road this weekend when they face Celtic at Celtic Park, their first of two visits to Glasgow in the space of four days. On Tuesday night they will face Rangers in the Scottish Cup Quarter Final replay at Ibrox, but the attention turns firstly to the league match. Neil Lennon will return to the Celtic Park home dugout for the first time in four years after taking over from Brendan Rodgers at Celtic. Two wins out of two have followed against Hearts and Hibernian in Edinburgh as he returns for a second spell. On Thursday lunchtime Derek McInnes and Dominic Ball spoke with the media to look ahead to Saturday’s match. “I expect a tough match regardless of who’s in charge. “Celtic have had a lot to contend with but the fact that they’ve been able to turn to Neil Lennon is as fortunate for them as it is for him to go back to Celtic. “The evidence is there that we’re a strong team on the road this season. I’ve always felt our away form has been good, but in this particular period it’s strong and the fact that we’ve equalled a club record shows winning at different grounds and the importance of the three points is there for us. It’s helped us because the home form hasn’t been the way we wanted since the turn of the year. The 2-0 victory over St Johnstone was the seventh consecutive away win for The Dons, which equalled a club record set in both 1936 and during season 1970/71. On Saturday Derek McInnes will be looking for the magical eighth when he takes his side to Glasgow’s east end to face Celtic. The run began in Glasgow, but on the other side of the city after an excellent 1-0 victory over Rangers at Ibrox. Scott McKenna volleyed home early and The Dons were able to see the game out despite having Sam Cosgrove red carded in the first half. 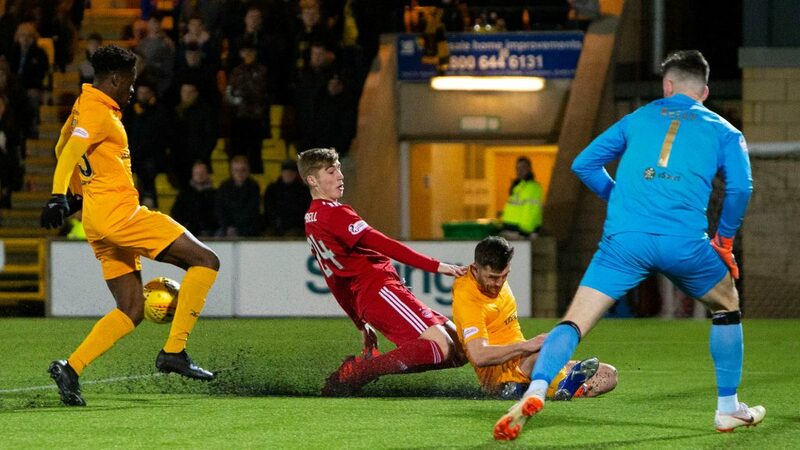 December brought with it nine fixtures in all and St Mirren and Livingston were seen off with 2-1 victories- Sam Cosgrove scoring the winner in Paisley, which was followed by Dean Campbell’s deftest of touches at the Tony Macaroni Arena, ensuring the perfect ending to 2018. After the winter break saw The Dons travel to Lanarkshire to face Hamilton Accies. Sam Cosgrove continued his fine form, which earned him the December Player Of The Month Award, and his double alongside Lewis Ferguson’s rebound delivered the points in a 3-0 win. The Dons were taken to a Scottish Cup replay against League One side Stenhousemuir after a 1-1 draw at Pittodrie prior to the Accies match. At Ochilview, Aberdeen made sure there would be no cup shock as they surged into a 3-0 lead at the break with the tie ending 4-1 to the visitors. Victory number six on the road came at Easter Road as The Dons faced Hibernian. It was the hosts that took an early lead, but The Dons responded in the best possible manner through Andy Considine. The goal settled Aberdeen down and they took the lead through Gary Mackay-Steven (not his first in this fixture) before the quarter hour mark. The visitors were forced into a change before the break as Joe Lewis had to go off after a nasty clash with the post. Tomas Cerny came on for an unlikely debut, but he was able to keep the Hibs attack at bay, producing a couple of big saves. The home form may not have been as strong as usual, but The Dons made it number seven away from Pittodrie thanks to a fine double from the captain, Graeme Shinnie at St Johnstone three weeks later. Dominic Ball laid it on a plate for his skipper and from 20 yards Graeme curled passed the goalkeeper with his right foot. It was an excellent contest played at a high intensity, but The Dons broke and Shinnie drove his team forward before firing another long range effort into the far corner to seal the points and a record equalling seventh win! Saturday sees The Dons and Celtic face off for the fourth time this campaign with the Dons looking for their first victory in the fixture. There has been very little between the sides this season, although Celtic hold the favourable record after three tight affairs. 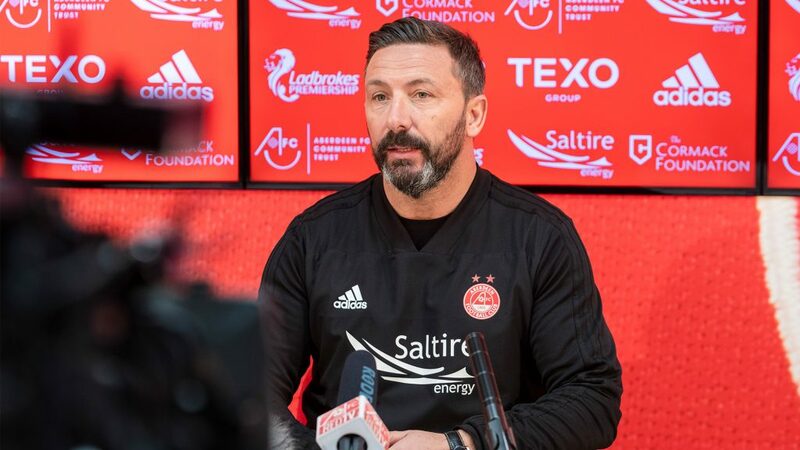 Aberdeen claimed victory on the final day of last season, which secured second spot in the league, but were undone by the same scoreline in September thanks to Scott Sinclair’s backheel from close range. The next meeting was in the Betfred Cup Final at Hampden. Once again it was a tight affair and unfortunately the moment fell to Ryan Christie, who after spending a season and a half on loan at Pittodrie scored right on half time to break the deadlock. 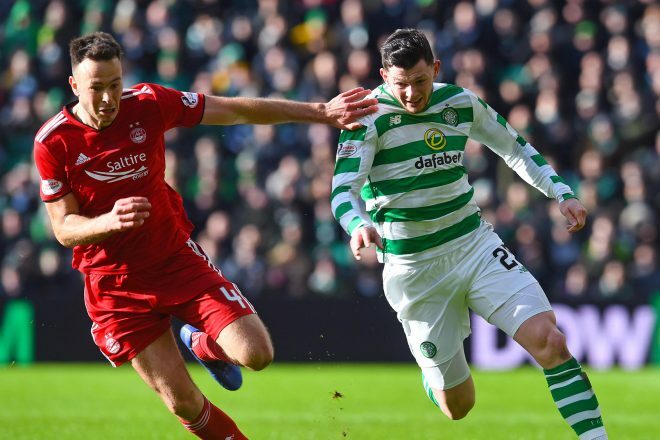 The Dons fought bravely in the second half and Joe Lewis even made a brilliant stop from the penalty spot, but they ran out of time as Celtic lifted the cup. The Boxing Day clash delivered an excellent advert for Scottish football, but once again The Dons lost out despite scoring three on the day. Celtic took the lead through Scott Sinclair after only six minutes, but Aberdeen equalised through Stevie May’s penalty 20 minutes later. Sinclair scored his second from close range with 15 minutes to play, but once again The Dons battled back with another penalty, this time dispatched by Sam Cosgrove. 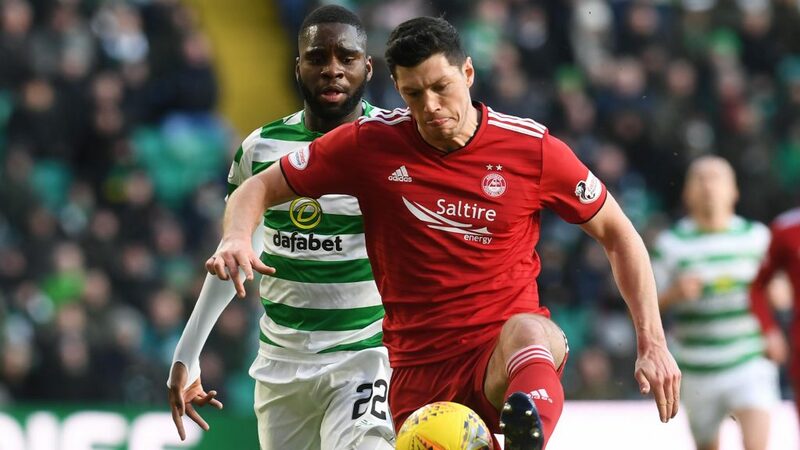 They were only level for three minutes though and Edouard and Sinclair all but sealed the points as The Dons pressed for a winner. They were given a glimmer of hope when Ferguson scored from a corner, but it proved to be too late. 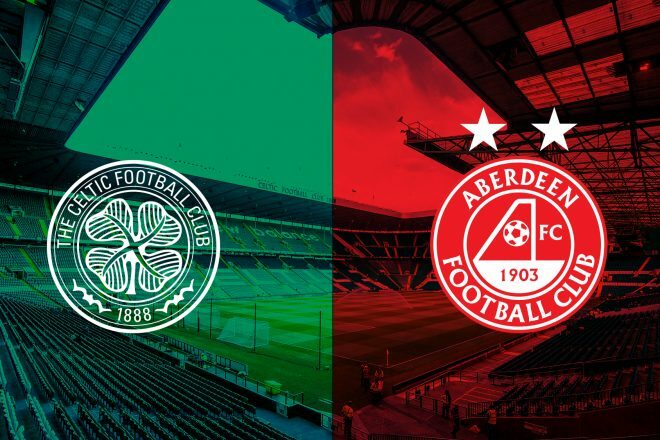 If you can’t make the game be sure to tune into our RedTV coverage from Celtic Park. We’ll be on the air from 2.45pm with RedTV international subscribers receiving live video. Post-match we will have reaction, a full match replay from 10pm and extended highlights and the goals from midnight. The Dons were not able to make it a record eight away wins in a row, but they did win a very well deserved point after a really strong performance. 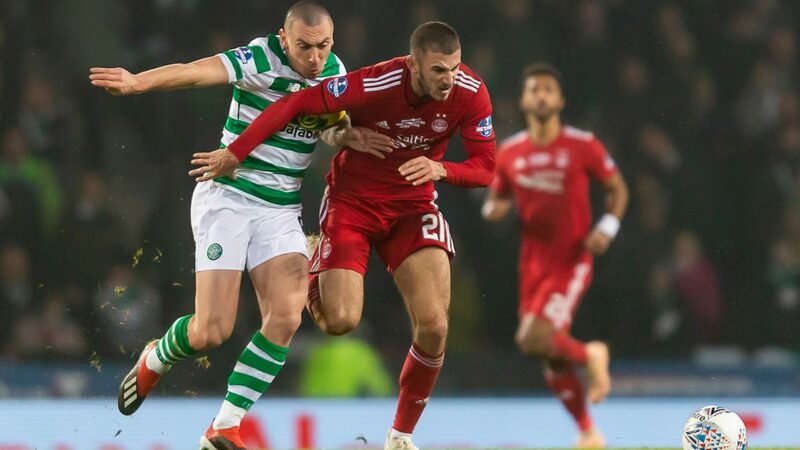 Despite a number of injury concerns, Aberdeen made just the one change for the visit to Celtic with James Wilson replacing Gary Mackay-Steven. Niall McGinn also missed out but Greg Stewart made the starting XI. As they went snapping into tackles the Dons were less that happy with some early decisions that went against them, especially when Cosgrove was taken down when through on goal, but referee Craig Thomson was unmoved. The game would go on to be very competitive throughout but the referee always had control of it. In the fourth minute Celtic forced a corner down the left but Aberdeen were able to eventually hack it clear. Three minutes later a dangerous cross from Tierney evaded Henderson but Max Lowe had to concede a second corner which the Dons defended better this time. Celtic won a third corner on ten minutes which again Aberdeen dealt with after Celtic took it short and tried to pick out Ajer. In the opening stages the Dons did have a few breaks forward but were a bit too careless with the final pass. Wilson though was seeing plenty of the ball on the left. 15 minutes in and although Celtic had plenty of possession in the Aberdeen half, the Dons defence had not been stretched. On 17 minutes Boyata tried to pick out the run of Burke but the Dons defence cut it out. On 23 minutes Cosgrove produced a neat flick to set Shinnie free. The skipper had space to run into but again the final pass let them down in a promising position. A minute later Aberdeen then produced their best passing move which resulted in Lowe swinging in a cross from deep. However Celtic then broke in numbers and the visitors were relieved to see the ball deflect off Considine and go behind for a corner. Henderson delivered a good set-piece but Boyata headed wide. Brown then produced a forward pass looking for the run of Sinclair but Lewis was quickly off his line to make the save. Just before the half hour mark Kris Ajer cut inside and drilled a low shot towards goal and the ball just went past the post. The keeper might have got a finger tip to it, if he did it was a very good save, or it took a deflection, but it went behind anyway. On 36 minutes, James Forrest broke down the right and his pace kept him ahead of the defenders. Once he was in the box he put a ball across goal which looked neither a shot nor a cross and it drifted harmlessly wide. Celtic appeared to be targeting the Dons right side, their left, and forced a number of corners but the Dons survived. On 40 minutes the first yellow card of the game as Boyata went into the back of Wilson after the striker did well to hold the ball in. 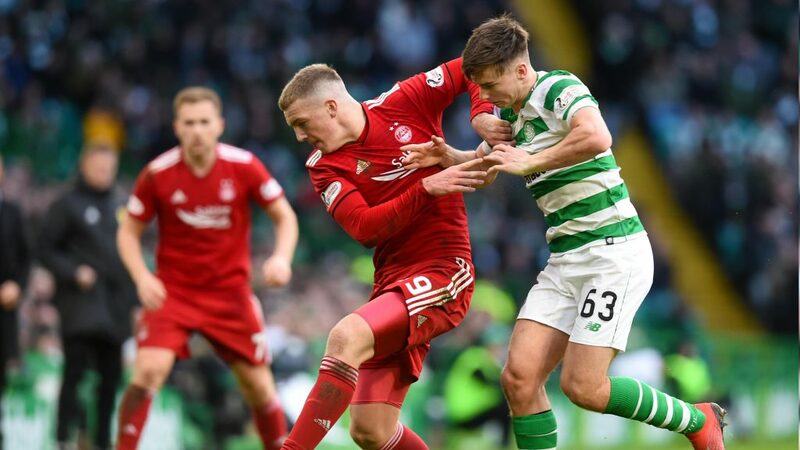 After 43 minutes Tierney again caused problems down the left and his pass picked out Forrest. From about ten yards out he tried to side foot a shot towards goal but it was straight at Lewis. On the stroke of half time Celtic had the ball in the net when Ajer headed home a free kick but the flag went up straight away for offside. Celtic at times enjoyed a bit too much possession in the first half but the Dons defence did very well to limit the chances. 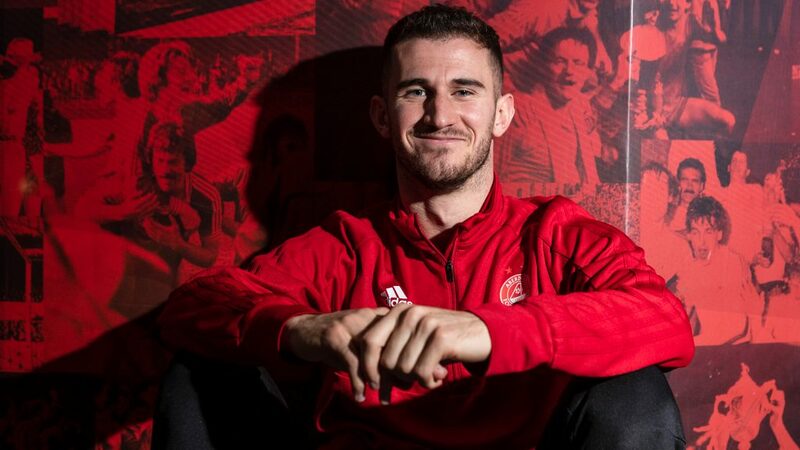 Aberdeen made a change at half time with Dean Campbell replacing James Wilson. It proved to be a very good tactical switch as it led to a much improved second half performance. Celtic meanwhile made a double change at the break with Michael Johnston and Odsonne Edouard replacing Sinclair and Henderson. Aberdeen started the second half really well. A minute after the restart they produced a good move when Stewart shifted the ball to the left but the cross from McLennan was just too strong for the head of Cosgrove inside the area. On 48 minutes a real opening for McLennan after a brilliant through ball by Shinnie. The striker had space inside the area but tried to step inside Boyata who was able to put a foot in. The Dons kept the move alive but Stewart’s chipped cross to the back post was chested back to Bain. Still Aberdeen looked a threat on the break. Connor McLennan again got in behind the defence but was unable to work an opening. Then a few minutes later, after some more excellent pressing, Greg Stewart and Dom Ball combined well which resulted in Ball hitting a low shot which was saved by Bain at his near post with his feet. 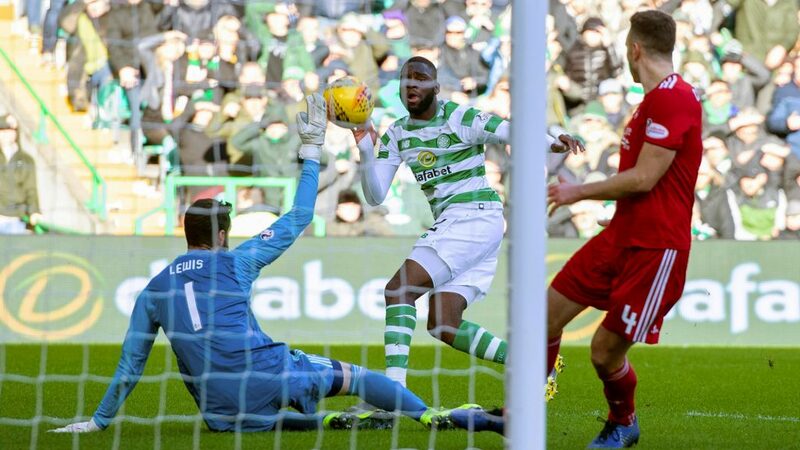 On 58 minutes, with the Dons well on top, all the good work was nearly undone when Edouard twisted and turned inside the area and Lewis was forced to make a very smart stop at his front post before Ball eventually scrambled the ball behind for a corner. An hour in, this was still anyone’s game. Aberdeen were enjoying a lot more of the possession and were protecting the ball well. On 63 minutes a poor kick out by Bain went straight to Shinnie. He played a one two with Stewart and managed to get a right footed shot away but it was blocked behind for a rare Aberdeen corner. Although the set piece was cleared, again the Dons enjoyed some good possession in the Celtic half. The ball was worked to Shinnie who this time on his stronger left side sent in a much more dangerous shot which was again deflected and just looped over the bar. From the corner Brown went to ground and Craig Thomson blew of a foul which relived the pressure. The midfield three of Shinnie, Ferguson and Campbell were playing really well and getting the better of the midfield battle. Young Dean had another superb outing at this venue. 65 minutes in, Celtic then enjoyed their first real spell of pressure in the second half and were camped in and around the Dons box. They put over a number of crosses but Aberdeen again defended their box brilliantly. Johnston floated over a cross to the back post which was just out of the reach of Burke and then Bitton’s shot was blocked. The defence looked so well organised this afternoon. With fifteen minutes to go McLennan had a shot blocked and then Edourard had the same at the other end. It was end to end stuff. Then Cosgrove did brilliantly on the right hand side of the box and put over a dangerous low cross which so nearly found McLennan coming in at the back post. From the corner Ferguson actually had a good shooting opportunity but miscued his shot. With 12 minutes to go Celtic made a final change with Weah replacing Burke. Then Bitton tried to play in Forrest but Lewis was alert to the danger and managed to get off his line to make the save. On 84 minutes another promising break for Aberdeen. Stewart had support but decided to try and an early shot and the ball drifted harmlessly behind. On 85 minutes Celtic won anther corner but Lewis, coming a long way off his line, took a great catch. With four minutes to go a major let off for the Dons when Johnston beat Ball but his shot went right across the face of goal. Then Johnston had another opportunity when he curled a shot just past the far post. With two minutes to go Stevie May replaced Greg Stewart. In the final acts of the game it was the Dons who almost won it. On 89 minutes Bain was forced to make a save from a Ferguson free kick. A few seconds later a deep cross was knocked down by Cosgrove and May had a great chance but was unable to direct his header goalward. The Dons then saw out the three minutes of injury time comfortably with Ethan Ross replacing Connor McLennan for the final stages. A very well deserved point and a real confidence boost ahead of Tuesday night.